so 6 would be 60 inches long? how is that for figuring a pattern on the fly? for .69 or so cents per tee I am in Heaven to get these made! I think my MIL showed me a scarf very similar to that the other day too. 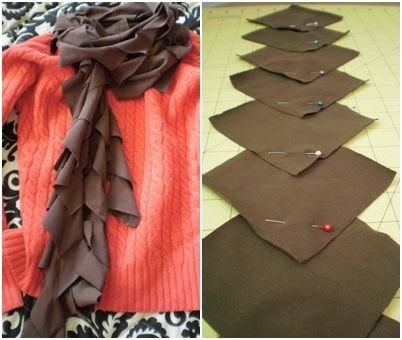 I think with a 2 inch overlap and using 7 squares your scarf would end up about 60 inches. I made a yellow one this morning of those tees I got cheap. and I have enough for second one! mine is 9 seven inch squares and finishes at 48 long. easy too!